Our independent, family-owned holiday park sits within fifteen acres of manicured grassland, in the foothills of the Lammermuir Hills. Centrally situated in the village of Greenlaw, just 37 miles South of Edinburgh. The site takes its name from the local river which meanders through its centre. Blackadder Water, and the wildlife it supports, are the star attractions here and, our riverside pitches provide the perfect vantage point from which to enjoy the view. Ask about our Fast, convenient and competitive Finance on all new and used Caravans. Blackadder Holiday Park gives visitors the best of both worlds: idyllic countryside and convenience. On site, we offer peace and quiet in our rural idyll but, a mere two-minute walk brings you to the Blackadder Bar and Restaurant, and other local amenities in the heart of the historic Border village of Greenlaw. The Caravan Park is Designated by Scottish Natural Heritage as a special area of conservation (SSSI ) noted as supporting the presence of Atlantic Salmon, Otters, Sea, River and Brook Lamperey, all threatened species in a European context. Herons frequently feed from the river, and Otters are occasionally spotted frolicking on the banks and in the water. 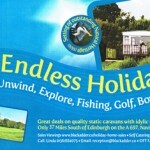 If you are thinking about moving on or or giving up your caravan, we’d be delighted to give you a price. All Caravan Parts and accessories supplied.